It seems like at least a monthly occurrence, the invitation arrives in your email inbox for a baby shower, baby luau or child’s birthday party. Time to head out again to shop around for the perfect present, but what kind of toys do they like? Do they already have this book? What is something every child can use and every parent can appreciate? Clothes – especially ones with eye-catching designs, inspired by the culture of Hawai`i. 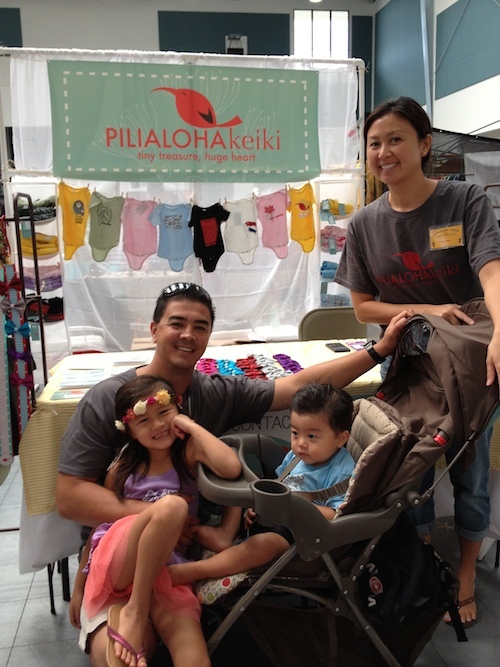 Working mom and budding entrepreneur Rondy answered a few of our questions about her brand new children’s clothing line, Pilialoha Keiki. Rondy, a teacher, started the line along with her husband, a registered nurse. 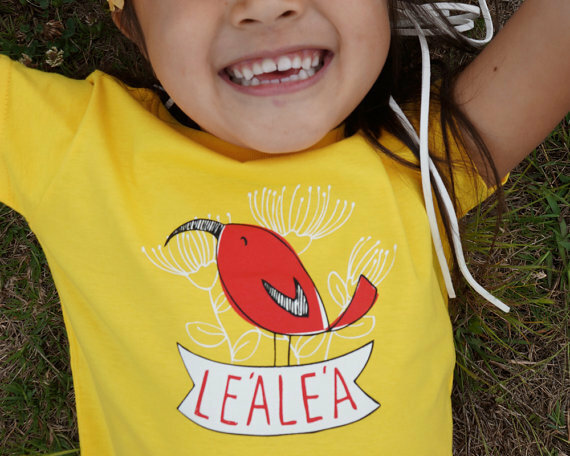 Le`ale`a means Joy and Fun in Hawaiian. 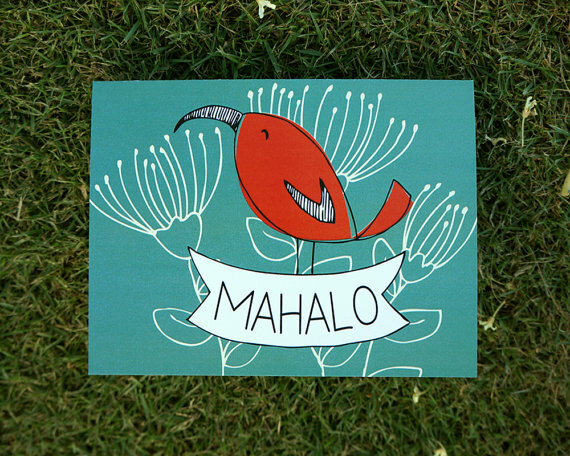 The ‘i’iwi bird, or native Hawaiian honeycreeper, is also on the Pilialoha Keiki logo. Maui Made: Where did the idea come from? Rondy: About 3 years ago my husband wanted to start a food based business so I decided to take a class put on by the Maui Economic Development board to learn how to start a business. The food idea didn’t stick but I had to come up with a business idea quick so that I could write a business plan in the class. At the time I had a young daughter at home and couldn’t find any clothes that reflected positive, local values and images. I decided to write a business plan based on this idea and called the company “Pilialoha Keiki”. Pilialoha is my husband’s middle name and it means “My Beloved”. I finished the business plan and the class, but after the class we didn’t pursue starting the company. We were busy with work and we also had another addition to our family so we just dropped the idea. On New Years Day 2014, my husband and I decided that we needed to do something for ourselves and we revisited the idea. I started drawing up designs and my husband worked on finding venues to sell the clothing. So far we have met some obstacles but we love the opportunities that this business has given us. My husband and I are introverted but by creating this business we go places we would normally wouldn’t go to, we meet so many great people, and we feel like we have grown so much by putting ourselves out there. I hope that the meanings behind the clothing will transcend the Hawaiian culture and will be meaningful to all parents and their beloved keiki. MM: Any items that are more popular so far? 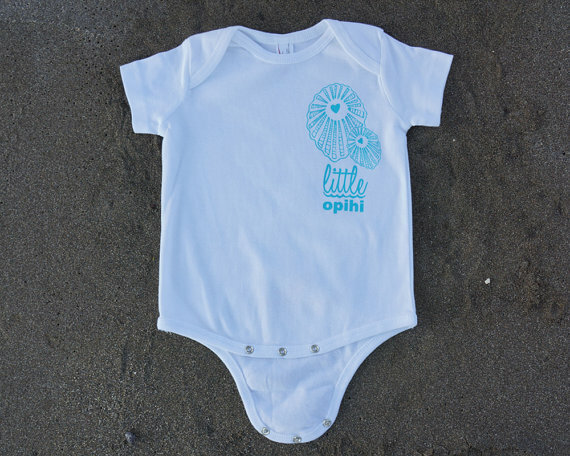 Rondy: So far our biggest seller is our “Little Opihi” onesies. I think that term is so endearing in Hawaii and people are so proud to say that they have an opihi. MM: Where are the shirts silk screened? Rondy: When I was thinking about starting the business, a former student walked into my class and said that he just got a job at a silk screening company named All Island Printworks. It was like fate, so we went with them. They are located in Kahului by Ace Hardware. MM: You’ve also made a line of greeting cards, where are they printed? Rondy: At first I went with a mainland company because I thought it would be the cheapest and easiest. After my first batch, I wasn’t too impressed so I searched around and found Ace Printing Services here in Wailuku. They are so nice and have great prices! MM: Are you the artist behind all these designs? Rondy: Yes, I design all the artwork. It’s so fun to do art again that I’ve been trying lots of techniques like drawing, linoleum printing, and computer generated art. I think I’m trying to be an artist again after about 10 years of not doing any art. Rondy: We have an Etsy shop, and right now we have been going to different craft fairs and events. We keep people updated on where we will be at through Instagram (@pilialoha_keiki) and Facebook. People also contact us to buy from us directly. MM: What’s next for you company? Rondy: We’re so excited to be accepted to the Made in Hawaii Festival in August as well as the Made in Maui County Festival in November. So far this experience has been amazing and we are just letting the business grow slowly and see where it takes us. Mahalo to Randy for sharing her story! Dazoo Restaurant and Pau Vodka Serve up the Fun! I have a baby gift I need to buy and this is more than perfect! I’m so excited. I also have an Etsy shop so am happy to support others. Mahalo for the update.